Congrats to Tom Colicchio for his James Beard Award nomination in the category of "Outstanding Chef." Did Grant Achatz take a swipe at Tom's Diet Coke commercial on Twitter? Speaking of commercials, what do you think of Padma's Hardee's ad? Matzah brei, matzah pizza, matzah mania! 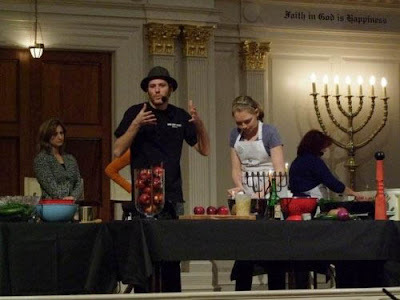 Chef Spike Mendelsohn dazzled us last December with his suave latke-making skills. 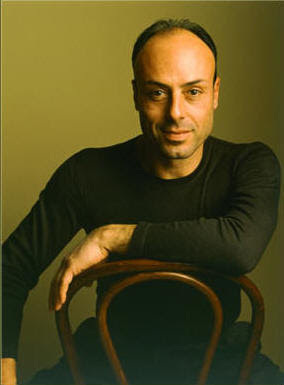 Just in time for Passover, he’s back with recipes to rev up your matzah. of how to create tasty meals, snacks and treats with matzah. And who knows, maybe Spike’s mom will join him on stage again? The cost of the event is $9. at the Sixth and I Historic Synagogue!! Carla Hall will be participating in Share Our Strength's Taste of the Nation on March 30th. Judge Toby Young shares tips on visiting NY with News of the World readers, including a recommendation for one of Tom Colicchio's restaurants. What was it like overseeing wannabe Top Chefs as a guest judge? I had a lot of thoughts about that. There are two challenges. I was quite impressed during the Quickfire at how free-thinking and spontaneous they were as a group. I was a judge early on, and there were at least 10 chefs I was judging. They had 30 minutes to put something together, and the results were stunning. The next day after they were given a whole night to think about it, a couple hours at night and couple hours the next day to prepare a dinner, they pretty much all fell flat on their face. It’s a funny thing—it’s like if you have to think too much about it, you screw up. I don’t know if that’s real life. I think some of those guys are good chefs. I feel like I oversee the aspirations of a lot of young chefs in the kitchen and have over many years. I’ve seen lots of talent come through the kitchen and gone onto being successful. There’s been a dozen or more stars. That’s been a really nice thing to be a part of. Season 4's Richard Blais is now a guest blogger for Creative Loafing. Read his first two posts here and here. Will Blais' Flip have a copyright issue with a similarly named burger joint in New York? Stephanie Izard is launching a video podcast. Want to see Hung Huynh cook a geoduck clam? Carla Hall is offering cooking classes in DC. Tom Colicchio discusses the restaurant business with Crain's. Season 3's Howie Kleinberg is opening his own BBQ restaurant in North Miami Beach. 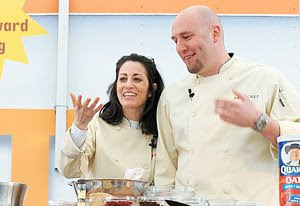 Did you know that Martha Stewart called Top Chef Five winner Hosea Rosenberg? BuddyTV got in on the conference call interview with Carla Hall and gives us the scoop. And Carla dishes with The Washingtonian about some of her local food favorites. ...to All Top Chef! Hopefully you will find this to be a comprehensive site on all things Top Chef - from the original series (just finishing up season five) to the upcoming Top Chef Masters and Top Chef Junior. We will endeavor to bring you all the latest in Top Chef news - good and bad - plus links to recaps and all sorts of fun things. To all prior cheftestants - we'd love if you would drop us a line at alltopchef@gmail.com and let us know what you've been up to and what exiting future plans you may have. We'd be happy to include the news here.